«Lo Spedalicchio» was meaning in the Middle Ages language small welcoming place. It was at that time the "mastio" of a fortified defensive wall, wanted by the city-State of the Municipality of Perugia at the borders of its own territory in order to control the road leading to Assisi. During the XVIth century, with the lost of importance of the military settlement, the city expands itself; around the antique tower dating back to 1300, by raising the strong defensive walls, a noble residence is built. Recently renovated, it is nowadays hosting the hotel with a privagte parking and a garden surrounded by high cypress trees. 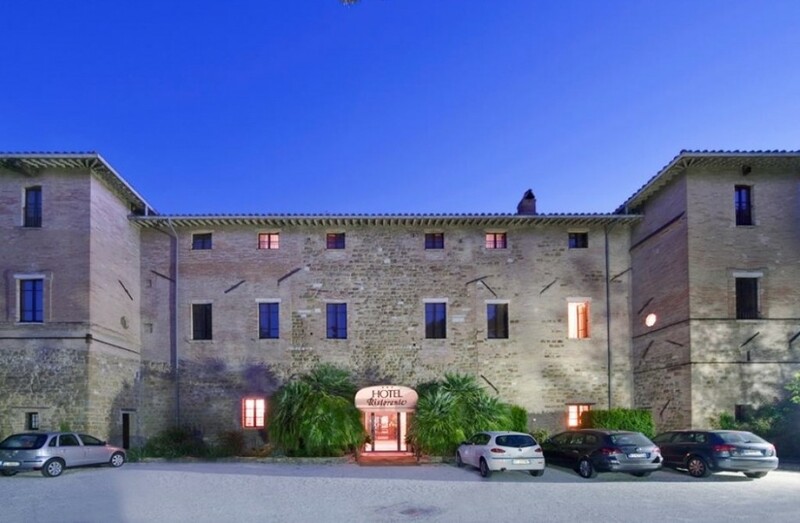 The hotel is welcoming its guests in 25 rooms, most of them located in large spaces at the noble floor, with high vaulted ceilings, also with mezzanine, and floors in brick; in the two lateral towers the roof is sustained by wood reinforcements. The rooms, divided between comfort superior, superior and standard, are equipped with wooden furniture, according to the tradition of the territory, typical fabrics of Umbria and ceramics of Deruta. They have all the modern comforts with air conditioning in summer and winter, bathroom with shower, telephone with satellite and in some of them Internet connection and sky channels on request upon booking. Minimum age : For all age. No wine for people less than 18 years old. Become a ceramist in the capital of the Umbrian handicraft: Deruta!